The theme includes two translation files, one for frontend strings (what visitors will see on your site) and one for backend strings (what admins will see when editing the theme options). You can translate either one or both if required. You can use these files along with translating software such as Poedit to translate the theme. Please follow the instructions below to translate the theme. 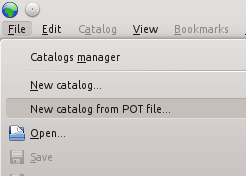 On the Poedit menu, go to File then New catalog from .POT file. and open the file /languages/storm.pot if you are translating the frontend or /admin/languages/storm_admin.pot if you are translating the backend. You’ll now be prompted to save the file as a .po file. You will need to change the filename to be the following. Once this step has been done, the theme should be translated inside WordPress, congratulations!